This is a guide for Nyx for everyone, not only for Nyx owners. Above the basics which are covered in other guides too, I’ll try to go into tactics as well. It contains important informations for those who don’t play/know Nyx – if is beneficial to every team member to know the Power of Nyx. 5. General tips – guess what. Sounds a bit weak, but this frame is far from lame. Actually, she is so powerful, I wouldn’t be surprised if it would be hit by the nerfhammer in the close future. Nyx is not for everyone. If you like to rush into the fight and massacre enemies in an instant, she is not for you. Nyx is for the cruel patient player, who likes to spend time killing their foes. Nyx rules over the weak minded (that is, everyone) forcing them to turn on each other. Her main role is crowd control, although those crowds usually end up dead pretty fast. Nyx is extremly good to play in Solo mode as well. But let’s start with the basics. Nyx can be either purchased from the store, or crafted from looted pieces. You need the usual 4 pieces: Chassis, Helmet, Systems and an Orokin Cell. The Nyx pieces (the blueprints for them, to be more precise) drop from Phorid (Naeglar, Eris) an ugly quadropod infestation boss. Okay, let’s say you have the frame. She is somewhat on the squishy side, with weak armor and not too much HP. Her unmodified shield and HP tops at 300/300 at level 30. She is quite fast though to compensate for this. She also has a lot of energy which she defininitely needs, as she relies heavily on her skills. She has the usual 4 unique skills. Mind Control, Psychic Bolts, Chaos and Absorb. I will write about these in detail in another section. These are Power polarity mods and of course Nyx comes with 4 Power slots. 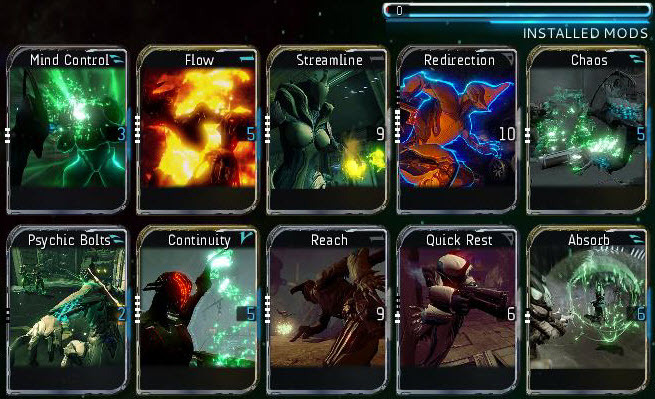 (polarity is the little sign on the upper right corner of the mod cards, match the slots with the mod’s polarity). She also has an Attack and a Tactic polarity slot. As every other frame, Nyx has a special helmet too. While it looks cool, it is not a really good one. According to the Wiki, it gives +25% Stamina, but lowers your Shield by 5% counted after the bonuses. As you will see later, you don’t really need Stamina, and if you do, you should just use a mod for it. Okay let’s talk about the Skills in detail. The 1st skill of Nyx, it costs 25 energy to use. You need to aim it towards an enemy precisely, but otherwise can be used from any distance. The mind controlled enemy will stop attacking you and your teammates and if there are other enemies nearby, he/it will engage them. Mind Control duration depends on the skill level, it is over 20 seconds when maxed out. Mind Controlled enemies emit a green sparkling vapor, so it is very easy to recognize them. If your teammates are not familiar with it, you should tell them what it means, so they attack the enemies accordingly. This is one of your most important skills. Since it is cheap, you can cast it frequently. It will work on any target, robot, infested, even the annoying rolling balls. The exception of course are the planet bosses, they are all immune to it. A powerful bodyguard. The other enemies will likely attack the controlled elite. Safety for your team from the elite. He won’t use any of his special skills against you or your teammates. This is especially important when you face Ancient Disrupters (the guys who drain all your energy). Time to dispatch it. While controlling the elite, you can damage him all you want, the Mind Control will hold. So you can simply execute a strong enemy while he won’t do anything to defend himself. Mind Control is also good when you need to go to a downed teammate. You just control some enemy, giving the others a new target and you the opportunity to revive him. Other times when you are overwhelmed, you can just control any enemy near you. Again, a lot of your other attackers will turn towards it, leaving you alone. If the team you are in is not all-so-powerful, Mind Control is good way to help them out, but they need to know what the green vapor means. Basically they should not kill off your controlled victim if it can help to clear larger enemy groups. It is cheap to control an elite several times in a row. You can indicate to the team when it is time to finish off the elite by starting attacking it (but it is always best to use the voicechat). Another use of Mind Control is when you are not interested in the actual room/area. You just control someone in the room, then rush thru it – they will entertain each other without you and completely forget to chase you. Yet another use is when you are exploring a room, opening crates, etc. Again, just control someone to give them a new target. This won’t make you invisible for them, so some of them still may attack you, but will give you time to loot the stuff. To Control faraway enemies, zoom in to aim. Always try to control the strongest enemy. If you control a weakling, the others will quickly dispatch it and turn back to you. This skill costs 50 energy and fires homing green bolts from your hand. You can somewhat aim them by zooming on an enemy before using it. When upgraded, it does a decent amount of damage, especially if all bolts hit the same target. However you have 3 more more useful skills, so using this skill is just not a really good idea. For example for 50 energy you can Mind Control 2 elites, who will definitely do more damage than your bolts. If Psychic Bolts don’t kill the enemy, it will have a green sparkling vapor effect on it – very similar to the Mind Control. Your other powers are much better and the green sparkles can confuse your teammates, who might think that a target is Mind Controlled. Your third and most powerful skill. For 75 energy you will wreak havoc amongst your enemies. Basically every enemy in the range goes berserk, attacking the nearest target. Even better, those under the influence of Chaos work as aggro magnet – drawing uninfluenced enemies toward themselves. And to make things even better (or IMBA) a lot of the enemies continue fighting each other after the duration ends! Chaos puts a green effect on the enemies, this one is a bit different from the earlier 2. It somewhat looks like a green hologram of a warframe. It is best recognizable on the infested quadropods. Creatures killed by each other won’t count towards your kills/damage/experience. This might show that you did very little damage and very few kills, while actually you killed literally a hundred mobs. This is your ultimate Crowd Control ability. Rush to the center of a crowd, spread Chaos, then vamooze. If you read the above description attentively, the ones under the effect of Chaos will attack anyone nearest. So don’t be the nearest. Just run out of the crowd and behold the Chaos consuming your enemies. With this skill, Defense maps will be a piece of cake. You use Chaos on a group and enemies from other parts of the map will go there to join in, completely forgetting about your teammates and the artifact they came to destroy. – They waste their ammo/energy. The enemies would kill each other without your teammates. This might become important at higher levels of defense maps. – They waste your energy. When you invest 75 energy in a skill, it should have some return. – They make the enemy return to their priorities – namely killing your team and the artifact/prisoner. Isn’t it better if everyone is safe? Of course your teammates don’t want to be bored, but they have a lot of things to do: they can kill all the other mobs who are not under the Chaos – there will be plenty around. Use Chaos only if your team needs it. If they are adept at dispatrching hordes of enemies, use only Mind Control to defuse elites. With Chaos, on Defense maps Nyx can hold one side alone, against any odds. The fighting arena (where you use Chaos) should be close to the arfifact, so the team members can easily access the loot/ammo drops. Your supposedly best skill, for 100 energy. It has a very cool animation, where you levitate in a lotus position, collecting all the energy of the hits you receive, then blast it all back to your enemies. It is a defensive skill (that is, the best defense is offense, right?) and best used in solo. The reason for this is that you actually have to absorb damage – if you don’t get damaged while you are levitating, you won’t shoot back anything either. That is a complete waste of 100 energy. So make sure enemies are attacking you when you do this; the more the better. You don’t need this skill often if you are adept enough in the use of Mind Control and Chaos. You can kill enemies stuck under the ground/inside walls. If they can attack you, just stand where they can hit you and activate this. If you have teammates, ask them to shoot you as well, since this skill collects and reflects back their damage too (they won’t be damaged). While levitating, you are invulnerable. The blast has a limited range, so try to position yourself in the center of a crowd before use it. Containers and other covers will block your deathblast, so try use it at open areas. It might be tempting to use this when you need to clear an area around a downed teammate. However the skill animation is so long, that by the time it ends, your teammate probably dies. Most of the time you should stick to Mind Control and Chaos instead. Here are 2 setups for Nyx – a 30 (standard) and a 60 points (Orokin Reactor) version. Since Nyx relies on her skills she needs mods to boost that. Luckyly she has the perfect polarities for these – an Attack and a Tactic slot. Add a Flow in the Tactic slot, upgraded to level 4, which gives 125% bonus to energy. With this Nyx has 412 energy when on max. In the Attack slot use a level 4 Continuity mod. This gives +25% Power duration, which is very important for Mind Control and Chaos. With all this, 6 points left. Use it for Reach, level 2. This is also a Tactic mod, and gives +22.5% Power range, making Chaos even more deadly. That is 30 points, the limit of the Nyx without Orokin Reactor. Why no Streamline (lowers the energy cost of skills)? Because this Nyx Already has 412 energy. That is more than enough for any situation. Streamline can be useful here only at the start of the map, when energy is at a low level or when a Disrupter drains your energy. But my experience is that even solo, this is very rarely a problem. For the energy, use the Energy Siphon artifact (can be looted from alerts with ? in them). This regenerates 1 energy every 2 seconds for the entire team. It is not much, but better than nothing. And remember, a Mind Control is just 25 energy. By the end of a Mind Control, you get back half the energy already. With this setup you can go into any level of map, even with medicore weapons. It doesn’t really matter what kind of weapon you have as long as you have energy, you can control the battlefield. Make sure though that you can actually kill the monsters, so at least one higher level weapon is advised. If you remove the Psychic Bolts, you can upgrade Flow and Continuity to max. 60 points is more than what you need. You still have 2 slots open and 16 points to spend on skills. You might want to upgrade your Shield or HP. 580 Shield (don’t ask me why 300 base and 280% bonus is 580, but that’s it) With Menticide helmet it is 551, so not too bad. With this setup, you can go in any map, do Defense maps solo, etc. Just keep up your energy and everything will be fine. GL HF! There is not much to say about weaponry – you won’t need them much. Still, keep one thing in mind: when you are doing Defense maps, you will need something to dispatch the last survivors. You need a level appropriate weapon for that, but other than that, it is entirely up to you. I prefer to carry a HEK shotgun to Defense maps, for several reasons. It has decent damage, especially when upgraded with the proper mods. It can one-shot every non elites. I call it the Sniper-Shotgun – when you zoom in, you can hit and kill targets really far away. It has a knockback effect. It becomes really important, when a high level Toxic Ancient dances around your artifact. Even if you Mind Control it, it will kill the Artifact with its area-poison. With HEK you can force the Ancient back. While it has only 4 shots, the reload time is pretty fast. The high damage enables to conserve ammo. It is ranged. Again, it is important because of the Toxic Ancients. The high level ones (60+) kill you very fast if you stand near them, so melee is out of the question. On any map, you can make do with only 1 decent weapon. Since Nyx powers are very good for conserving ammo, you will rarely have problems with that. I prefer to use a Wyrm, with Cold weapon. The Sentinel will fire on any enemy, and the cold damage will make them slow, so even if you didn’t notice it, you have a good chance to avoid it. Another useful skill for the Sentinel to replenish your warframe’s shield when it reaches 0 (Guardianmod). It is useful in any heated battle, but best is against Phorid (boss) who has a boss power wich will damage everybody for 300 damage. If you don’t have that much shield, it will hit your HP as well. But if you have a Sentinel, it just reloads some of you shield again, so you won’t get damaged. These tips and advices are for everyone. You can get a lot of things for free (without using Platinums). You just have to invest time. If you can’t afford to spend money on the game, use your 50 platinum to buy Warframe and/or Weapon inventory slots. Almost everything else can be looted/bought for credits. In the Market when you see a credit price and a platinum price, you can choose which currency you use. So it is not Credits AND Platinum, it is OR. Open up as much maps as you can. You can receive alerts only at levels which are accessible to you. Yellow is good enough. You can hop over unlocked areas if someone else in your team has that map already open. To gain player (account) Rank, you need to level up weapons and warframes. Do defense maps to collect mods. The higher level are the enemies, the more chance to drop rare mods. Fight bosses at an open area to avoid losing the possible blueprint drops (which may fall into a chasm or something). On Defense maps, don’t let Toxic Ancients near the artifact. Even if they are controlled, they will still poison it to oblivion and you will lose the map. This is especially important at higher level Ancients whose poison is VERY potent. Outdated. Nyx is yawn now.